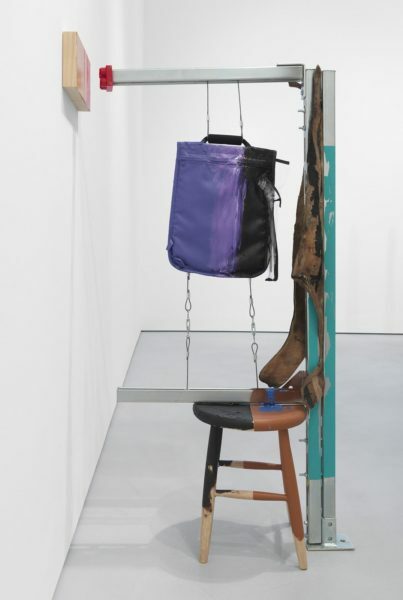 Jessica Stockholder. “Detached Detail,” 2016. Installed: 57 1/2 by 46 1/2 by 60 in. Industrial metal fencing, dance floor tile, leather, vinyl, rope hardware, floor tile, floor mat, masonry square tile, bent metal rod, acrylic and oil paint. 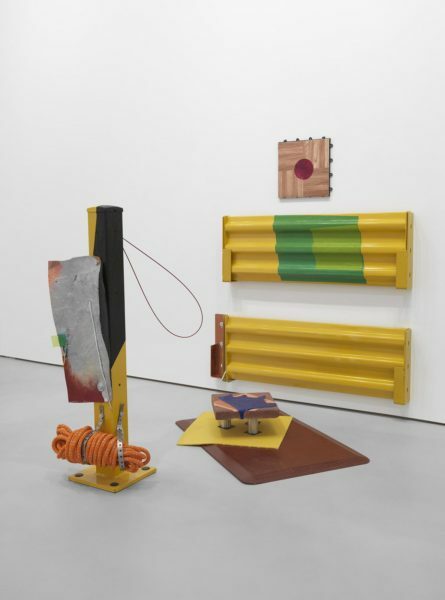 Over the last month I have had the pleasure of peppering Jessica Stockholder with questions, each one sent with days or sometimes weeks between, so that the conversation itself extended through a peculiar duration. Unlike other interviews that happen either over three email exchanges or the course of a couple of recorded hours, this became more of a correspondence in which questions and answers hung, suspended and marinating for a while before getting shored up and integrated into a cohesive text. I’m not sure if the process is necessarily apparent to readers, but it had a tremendous impact on my own thought and I can’t help but situate it within my experience of Stockholder’s installations. While remaining deliberately outside of language, she often addresses an entire architectural site with a bundled installation—small groups of objects, materials, and paint that flow on or through walls and into space. These moments punctuate the environment, accumulating like constellations to map an area. As such it is impossible to have a single, objective perspective of a given work, for by entering the space of a Stockholder show one automatically becomes an interactive participant. CP: Whenever I’m inhabiting one of your installations, I feel like my experience is tied to social, global, and economic networks out of which your assembled objects emerge. I wonder if your relationship to objects has changed over the years? What might be the difference, for instance, between a cooler you used in an early 2000 installation to a mounted freezer you used at Kavi Gupta gallery last year? JS: I first came to, and still come to, using objects with an immediate and ahistorical attitude. Primarily I wish to orchestrate a collision between my own structure of thought and all that stuff out there in the world! It’s a way of ascertaining the nature of who I am and what it means to be human. At the outset the activity is akin to philosophy. Of course my thoughts and the stuff of the world are all inflected by this moment; I don’t exist outside the flow of time. As a result of paying attention to objects over the years I have become more attentive to their particularity, and engaged with the multiplicity of ways that stuff is meaningful. I care about where things are made, who makes and designs them, systems of fabrication, and nostalgia embedded in things. And over my lifetime there has been enormous change in the quality and quantity of objects streaming by. I notice that there is a kind of fashion in the color of plastics—the same colors will move through the marketplace showing up in many different kinds of objects. For the most part my work is not driven by verbal narrative—however in retrospect, I think that I’m drawn to refrigerators, freezers and coolers repeatedly as they are, like gallery spaces, cold and yet filled with a kind of love. They are also, like much of the stuff around us, participant in a rectangular geometric abstract and efficient structure of production that is resonant with architecture, framing, and thought. 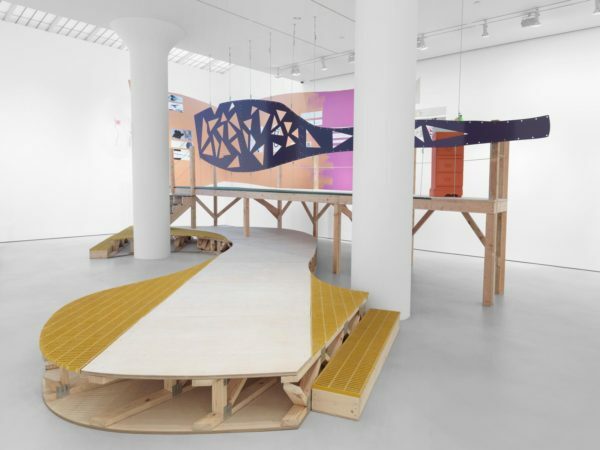 Jessica Stockholder, “Sharp Cloud,” 2011. 31 x 42 inches around. Height variable. Light cords take up more space on the ground. Plastic containers, chain, wire, broken blue pottery, bungee cords – black and green, driveway mirror on weight, power bar for cords to pug into. zip ties, rubber mat, fluorescent orange vinyl, orange extension cord loop, light fixtures, fluorescent light bulbs, blue rubber bath mat. 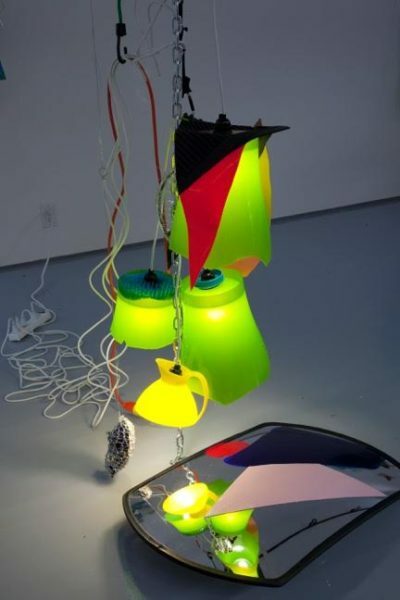 Jessica Stockholder, (No title) JS#524, 2011. 15 wide x 18 high x 8 inches deep. Green clamp, printed metal sheet, wire mesh, rivets, carpet, acrylic paint, plastic parts, thread, TV mounting hardware. JS: I’m attaching two images that might indicate a trend from 2011 and 2012. Though far from scientific, it seems clear to me that there are far fewer colors of plastic floating around than could be the case. (I imagine that people share recipes…) Around us, and inside of my own work, I’m always taken with my own complaisance with what is…I’m struggling to find a better way to say that. What is is irrevocable, but nevertheless runs seamlessly into imaginations of what could be—with fantasy life. It seems important to me to notice the constraints within which the actuality of our world exists Noticing the limits of color in plastic production, the limits of and quality of aesthetic choices around us allows for more freedom of thought. CP: If certain colors appear in mass produced objects for limited periods of time, do you find that you start to rely on particular combinations? For instance, in the two images you shared, I see the lime green, yellow, mauve or peach, and navy blue—if that constellation of colors appears regularly, are you concerned about addressing them in new combinations always? And if not, if you come to enjoy a particular color relationship, what is your experience like when a color goes out of circulation? JS: I have noticed that colors are shared in industry—but I don’t spend much time tracking that phenomenon—and I am fortunate that paint enables me to engage an endless array of colors. I am always trying to find something new in my use of color though I’m aware that I am at the same time wedded to a certain level of intensity. My process allows for great flexibility in relation to what I need—basically I need my own thoughts and some stuff in the world for them to collide with. And I need color! I don’t suffer over the exact supply of any of these things. Letting the thoughts/ ideas/ energy to make things flow is probably the greatest challenge; and so far I’ve been lucky to have flow! CP: I heard somewhere that washing machines and dryers from the 60s and 70s were often the same blue/gray/green-color because the US military had a lot of leftover paint. It had been originally mixed for WWII battle ships but went into circulation for popular use thereafter and was quickly co-opted by other appliances. It seems interesting because what you’re describing points out how complex my own sense of nostalgia and aesthetic appreciation might be for that color; suddenly my sentiment is connected not just to a fantasy of Modernist America, but also to a war. Does that kind of awareness influence you? JS: Yes and no. What you describe makes sense to me, but when I’m working I’m not focused on any single narrative fleshed out as you have conveyed. I’m not focused on narratives at all—I’m interested in my peripheral vision, so to speak, in how a multitude of nostalgias, upsets, gleefulness, memories, or references to types of people, all fly at once from the myriad materials I’m working with. That kind of narrative information is not controlled in my work—it’s an appreciated backdrop for something else that I’m doing involving how my direct experience of stuff bumps up against the abstract contours of mind. Jessica Stockholder, “Security Detail,” 2016. 61 1/4 by 15 by 36 in. Unistrut, old scrap of tire, wooden stool, hardware, braided metal cable, plastic parts, shoulder bag, acrylic paint, oil paint, roofing tar, two 6 x 6 x 1 inch painted panels. CP: How do you decide what kinds of materials and colors to work with when? Do you feel like that criteria changes depending on the peculiarities of the site you’re working with? Or are there periods of time when, looking back, you realize you were particularly drawn to a set of experiential concerns? JS: That question just doesn’t resonate! I work with all kinds of stuff for all kinds of reasons—and sometimes for no reason. CP: Maybe we can try this instead…I was reading your Elizabeth Murray at MOMA essay and was struck by you’re your interest in irritability. You write this “In addition to admiring Elizabeth’s work and making sure that I saw her exhibitions whenever I could, I have also found her work vaguely irritating. In front of the paintings I find myself always embattled, enjoying them and feeling irritable. Looking more closely at my irritability is rewarding. I find that these paintings embody a string of dualities sitting uncomfortably next to each other and exuding an irritable and provocative charge.” I wanted to pursue this idea of irritability, maybe because in some way I feel like I’m inadvertently asking you for some singular thesis about how you see and work with objects, even if that request is impossible. If information is not controlled in your work, how might irritability guide that process? JS: Yes, irritability is a nice thing to look at. I think that question intersects with questions about beauty. I associate beauty, though a changeable category, with comfort and pleasure. I am interested in exploring the relationship between the two—irritability and beauty—alongside a back and forth between stasis and movement. Of course my work doesn’t often move—but the observer does move and the visual presented by the work is consequently always shifting. Art is a very good place for upset, unhappiness, anger, rage, violence, the obscene, and irritability. In the context of that sentence irritability sounds pretty mild! Your question brings my colleague Bill Brown’s work about “Thing Theory” to mind. He writes “We begin to confront the thingness of objects when they stop working for us.” I don’t think that I’m focused on the duality between thing and object—rather I often orchestrate circumstances for the two categories to blend into each other seamlessly. I’m more often focused on ‘things’ or ‘stuff.’ That said—I also tend to the object nature of the stuff—their use rattles around with their thing nature. Perhaps some people find irritability in the movement between thing and object. I find that slippage elating. Irritability arises for me in the struggle to encompass enormous amounts of difference and invited chaos into a controlled and orchestrated beautiful unstable whole. Installation view of Jessica Stockholder: The Guests All Crowded Into the Dining Room at Mitchell-Innes & Nash, NY 2016. Photo: Adam Reich. JS: Yes—slippage matters! I often use the word “blurred.” Boundaries are blurred. The viewer slips between audience and actor. The artwork is sculpture and pedestal. The work is both painting and sculpture. 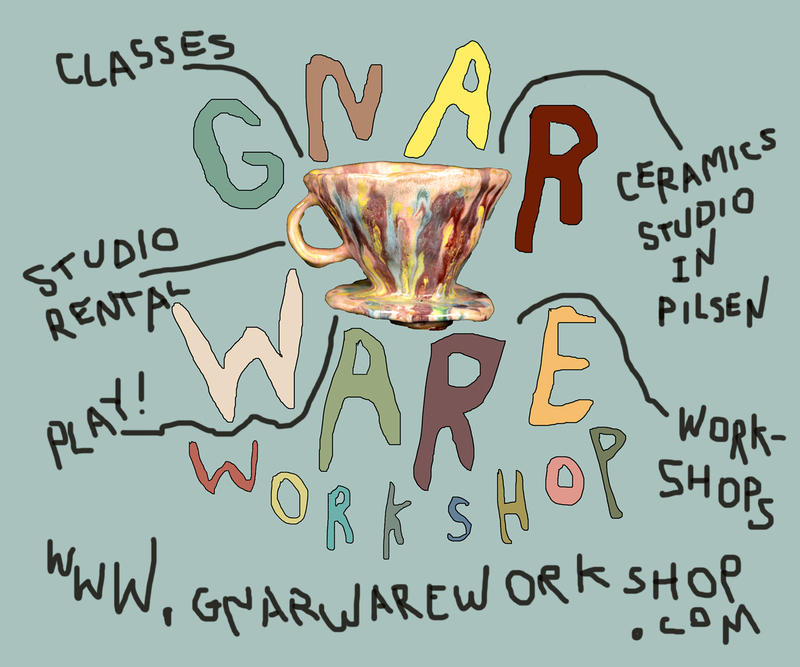 Where is the line between found and made? Is a 2×4 a found material? I don’t think it’s a “natural” material. Generally, I don’t think that the objects I use are distinct subjects in the work. I often like to use objects in ways that enable their edges and singularity to melt into other stuff around them. The thing that I’m making makes use of parts of them. In order to see my work, you have to let your vision blur so that you can at least for some moments forget the distinct outline of the objects used as building blocks. CP: Can we talk more about periphery? Someone told me once that there are certain stars you can only see with peripheral vision. Somehow that type of seeing also feels tied to slippage, maybe in part because of something you wrote in “Peer Out to See,” a text reflecting on a 2010 site-specific work at the Crystal Palace. You say, “Looking back at my work from this rattled world, I can see the cracks in my imagination, cracks of inquietude, becoming real chasms in the world that I know.” What is it about peripheral sight that allows us to see differently? What is the benefit of the chasms that start to appear and take hold? JS: That question can be understood literally and metaphorically. 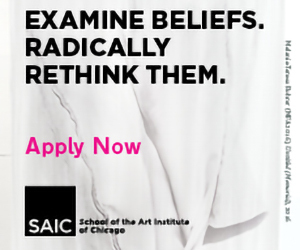 My work pivots around the ways in which actual physical phenomenon resonate metaphorically with thought and how we find meaning. Sight is blurred when the eye and body are moving and what we see is crisp and clear when our bodies are static. Our peripheral vision enters this continuum. Tending to the limits of our capacity lets us know more about what’s out there.